Xolisani Ndongeni (24-0, 12 KOs)–One of South Africa’s favorite boxers, with his skill and charisma making him a popular presence wherever he fights. With a style that is as difficult to read as his name is to pronounce, the man they call ‘Nomeva’ is unbeaten in all of his 22 fights. Ndongeni hails from the Eastern Cape, a province of South Africa that is the heartland of local boxing, which produced the like of Vuyani Bungu, Mbulelo Botile and Simphiwe Vetyeka. As a youngster growing up in Duncan Village, Ndongeni says his opportunities were sparse. His local gym flooded whenever it rained, and boxers frequently trained by candlelight. His first love was rugby, but he turned to boxing at age 17 at the urging of his cousin, a pro fighter named Thabo Sishwana. He had 29 amateur fights, but admits he hit no great heights. 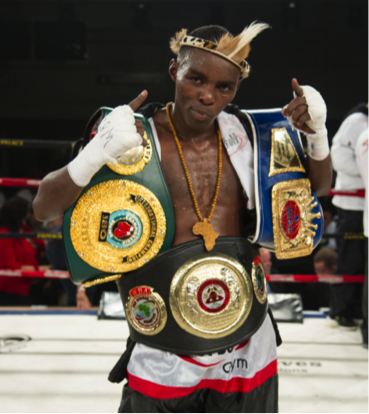 In his South African hometown, Ndongeni captured the National Super Featherweight Title in his 10th fight and has since gone on to win the vacant IBO Lightweight belt. He is currently rated number 2 by the World Boxing Association. A member of the Xhosa tribe, he is a local hero whose fans ululate and dance whenever he fights. He even has his own praise song, ‘Nank’ uNomeva, whee Nomeva,’ which his supporters belt out at his fights. In one of the biggest tests of his career last year, he beat former IBF Champion Mzonke Fana, announcing himself as a serious player in the lightweight division. In another career turning point, last March Ndongeni packed his bags and moved to Johannesburg, linking himself with established trainer Colin Nathan. It was a bold move, particularly as his hometown fans were disappointed. Ndongeni, however, knew that he had to make the change to propel himself internationally. On November 4th, Ndongeni excitedly made his American debut with a 10 round unanimous decision win over Juan Garcia Mendez in Corona, California. The fight was a featured bout on the undercard of a Showtime ShoBox event. Ndongeni is a world champion in the making, and he will soon be returning to the USA to fight again.